If you or a loved one are experiencing a dental emergency, don’t hesitate to contact Scott D. Bunday, DDS. Our dedicated Plano, TX dentist and team are happy to help patients experiencing dental emergencies. In most cases, we’re able to offer emergency treatment the same day you call, and if we’re unable to offer an immediate appointment, one of our knowledgeable team members will walk you through at home care over the phone. Even if you’re not sure whether or not your oral health concern is an emergency, we encourage you to contact our team anyway. Most oral health issues will worsen over time, so the sooner we’re able to implement restorative dentistry treatments the better. If you’ve experienced dental damage or decay, use ice packs at 20 minute intervals to relieve pain and reduce swelling. You can also take over the counter pain relievers, but never place aspirin on the damaged area. 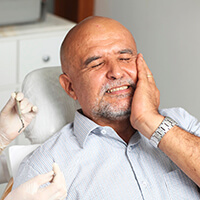 If you experience a dental emergency you think may be life threatening, we encourage you to proceed immediately to your nearest emergency room. Your overall health is important to our team, so we’ll be happy to work with these emergency medical professionals to repair your damaged smile once your overall health is no longer at risk.